The number of Australians living in high-rise apartments doubled between 1991 and 2011 and that trend has continued since then. The quarter-acre dream is fast disappearing and larger blocks and family gardens along with it. As more people move from country areas to the city and as land to build homes near the city centre becomes scarce, we’re getting further and further away from nature. It turns out this isn’t great for our health. The change in urban environments because of development, associated with a rapid increase in chronic disease, is a global phenomenon in developed countries. In the past children grew up running on bare soil and grass, explored backyard farms and gardens, climbed trees and were exposed to a high level of bacteria. And the diversity of the bacteria can change if an individual is exposed to different environmental conditions. One of these conditions is living in a high-rise apartment far away from land, soil, trees and plants. 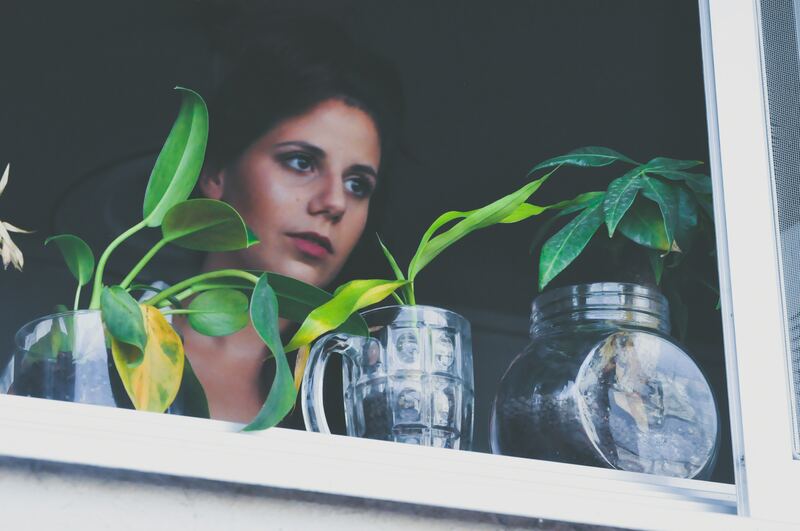 Being close to nature is linked to positive mental well-being – and people living in urban areas have been shown to have a disadvantage in processing stress. This can be at least partially attributed to increased exposure to air pollution and heat stress, and decrease in exercise and fitness through lack of access to a garden or nearby park. The less exposure to nature we have, the less diverse the bacteria in our microbiota. The microbiota is the community of bacteria, fungi and viruses that live in our gut and on our skin. We need a diverse exposure for our body to fight inflammation effectively. Alteration in the human bacterial communities, including the disappearance of ancient microbiotic species, is thought to cause inflammation in the body. These ancient species were known to encourage development of cells that regulate the immune system (T-cells). When our immune system stays on high alert all the time, instead of resting when no threats are present, this causes inflammation, which can lead to chronic disease. The bacteria we have are similar to those of plants in that we both carry trillions of good and bad bacteria. The diversity of the microbiota is measured by how many families of bacteria are present. We know the diverse plant microbiome influences plant growth, and humans benefit by eating plant foods. An important research question remains: do we gain another benefit simply by having contact with plants? Plants also remove volatile compounds from the air including ozone and carbon dioxide. They turn the carbon dioxide into oxygen, meaning air quality is drastically improved. Higher oxygen levels inside a small apartment mean well-being may be improved for the occupants. Viewing plants reduces stress and is pleasing to the human eye. Nature therapy (shinrin-yoku), first invented in Japan, has proven beneficial for our health by lowering blood pressure and boosting mental health. This is done by simply going for a mindful walk in the forest. It has also been established that plants confer positive changes in the brain’s electrical activity, muscle tension and heart activity. 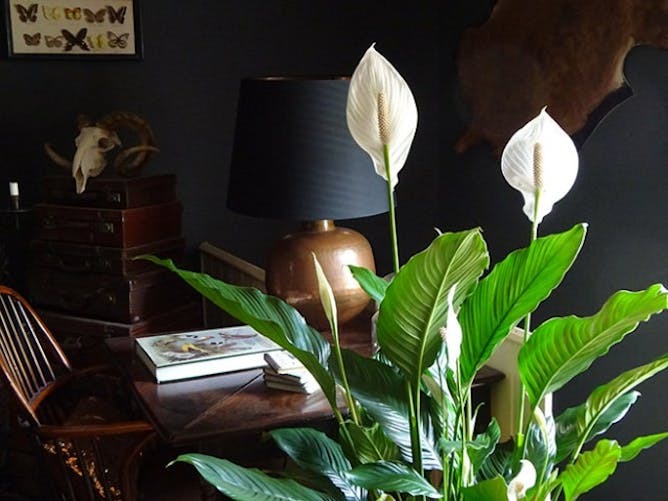 Peace Lily: if this plant is placed in the hallway it will reduce many toxins such as benzene, ammonia, acetone and ethyl and will prevent toxins from spreading between rooms in the apartment. 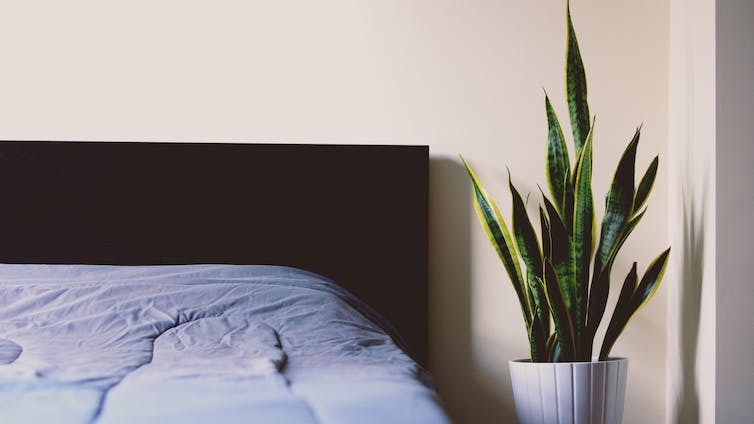 Aloe vera and Mother-in-Law’s Tongue: these plants placed in the bedroom emit oxygen, which improves sleep quality. 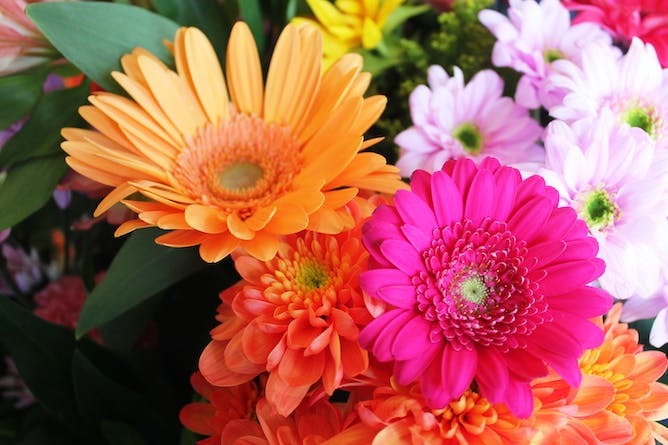 Gerbera daisy: if placed in the laundry these plants remove formaldehyde and benzene from the air, which are in common household detergents. 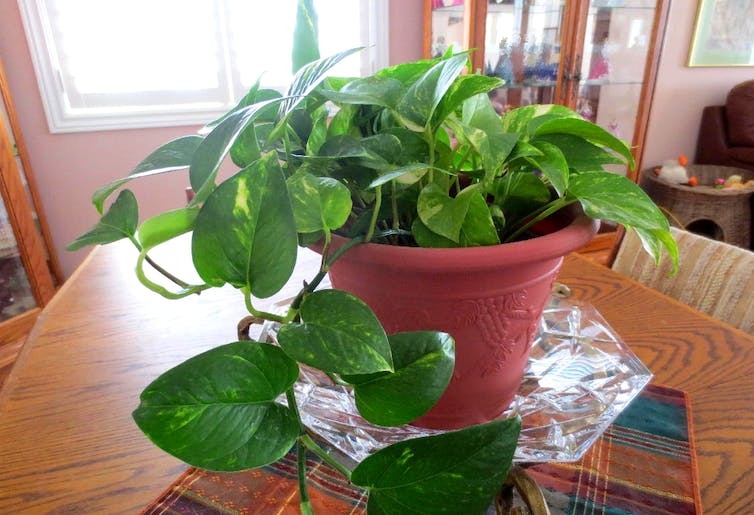 Devil’s Ivy (Golden Pothos): this plant can be placed in low light and cool temperatures such as an air-conditioned office or an outdoor garage. It will remove ozone, which is found in car exhaust fumes. How about plants outside apartment buildings? Outdoor plants such as trees and shrubs help to shade our buildings and streets, cooling our concrete jungles. They also help with water runoff, preventing flooding and nutrient dispersal. Suburbs with more canopy cover have a perceived higher quality of living and attract better property prices. Outdoor plants and soil have an abundance of ecological communities compared to indoor environments, a higher diversity of microbes, and therefore increase the numbers of insects, birds and other fauna. Viewing and being among large parks and green areas has been shown to improve the mental and physical well-being of people living in urban areas. energy savings from better solar reflectivity, evapotranspiration and insulation, green roofs last up to twice as long as regular roofs, and green roofs can beautify and add value to Toronto’s buildings by providing scenic views and recreational areas in dense urban areas. A similarly bold strategy here would benefit not only the health of our apartment dwellers, but also the environment. Plants also remove volatile compounds from the air including ozone and carbon dioxide. Since when has carbon dioxide been a volatile compound? Oh dear me,….. did I learn all my photosynthesis light-reactions incorrectly? I thought the oxygen produced during photosynthesis derived from the breakdown of water molecules. Maggy: in earth and planetary science, carbon dioxide is a volatile (it degasses from magma in explosive eruptions). The EPA reference is about volatile ORGANIC compounds such as formaldehyde which can be indoor air pollutants. I assume that you would recommend that the plants be chosen that produce low levels of isoprene, which I understand is a carcinogen. The white latex liquid from a cut lettuce leaf and rubber tree sap is isoprene, but I think mostly it is expelled by plants as a vapour. So in a closed-up building the concentration might rise, increasing the risk. Have you considered this? In the context of an apartment, I don’t think outgassing episodes of CO2 from magma are relevant. If there is Lake Nyos episode happening nearby, a few plants aren’t going to save you. Well this is a load of tosh isn’t it. Following the link regarding the Peace Lilly, the research cited does not support claims that the plant reduces toxins and prevents the spread of toxins. In fact the abstract specifically states that this claim is “questionable”, which is polite sciencespeak for unsupported nonsense. Which leads me to the conclusion the rest of the guest article is also “questionable”. I have only just found this article and read your comments. Ashton, there has been a huge NASA study on indoor plants and removal of toxins, and many plants will remove toxins, including organic compounds from the air. I believe there is a link to this study in my article.